Today is National Siblings Day. 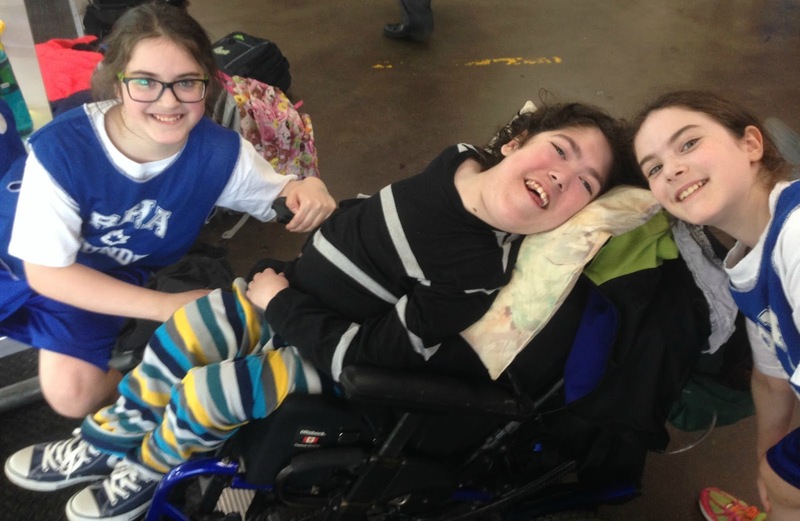 This is a moving and illuminating piece from Jamie Trossman, 12 (right), about a time a year ago when her brother Jacob, 14 (centre), went into respiratory distress. Jamie’s twin sister Sierra is on the left. I was sitting at the kitchen table, reviewing my homework, when someone called from the family room. I left my semi-finished homework on the table and went to the family room. My 14-year-old brother, Jacob, was lying on a mattress, accompanied by a nurse called Dawn. I nodded and knelt beside Jacob. Painstakingly, with these yes and no questions, I deciphered that he wanted to go to the park with me. So we did. When we returned, I lay down eagerly on my bed to read Harry Potter for the fifth time. Mid-sentence, just as Umbridge was being dragged away by centaurs, I heard Dawn call me. She was stuck, again, trying to figure out what Jacob was saying. After we realized that he was uncomfortable, and wanted to be turned, I went back to my book. But before too long I heard “Jamie?” It was Dawn again. I appeared in Jacob’s bedroom. She handed me a blue cellphone. I dialed my mother’s phone number. Jake let out a muffled shout. Dawn was fumbling with the BiPap machine, a machine that helps my big brother breathe. When my mom picked up, Dawn told me to say that Jacob was in respiratory distress and oxygen and suctioning weren’t making a difference. Now my heart was racing: it sounded serious. My mom told me that she’ll be right home and she’ll get my sister Sierra to hurry up leaving gymnastics. When I hung up the phone, I noticed that Jacob’s face was becoming redder and redder. I searched frantically for a plug fitting that description. Once I located it, Dawn instructed me to plug it into the wall and I obeyed. Just then, Jacob let out a cry of pain. I felt his fear and helplessness, like a sharp knife was slashing these emotions deeper and deeper into my flesh, making them stronger and stronger. “On the BiPap machine,” Dawn told me, her voice beginning to shake, “there is a small black dial. Move it over five squares to the right.” I moved the dial and as I did, my fear blossomed. Why was Dawn’s voice trembling? She shouldn’t be so scared, she’s a nurse, I thought. I’m supposed to be able to count on her to know what to do. She must have done this before. When the nurse panics, everyone panics! I bent over him and whispered encouragingly to Jacob, telling him it would be all right. Yet I could hardly convince myself. I was drowning in fear. It was no use, as he could not hear me over the shrill beeps from his machine telling us the obvious: he was not okay. A horrible thought entered my mind, one I had never voiced out loud, not even to myself: What if Jacob doesn’t survive? He’s probably already dying, I thought. I looked up to see my mom standing over me. She turned on a bubble machine that emitted a very peaceful, calm sound of rushing water. We continued to listen to the water, when it wasn’t drowned out by the beeps of the machine. After about half an hour, my dad rushed in. I kept my sweaty hand clasped over the oxygen mask and tried to calm my brother down. My parents and Dawn tried multiple techniques and oxygen machines. Then my mom spoke. I had no clue what she was talking about. Dawn, Dad and I were helping. What else could we do? “911?” croaked my dad. My mom nodded, and my wet eyes widened. A voice came from the hallway. “I don’t want to be here when the paramedics come,” said my sister Sierra. Her eyes were swollen and swimming in tears, just like mine. “I want to go with you,” I said to Sierra. I didn’t want to see what happened. In my mind, I pictured scary looking people in white coats or uniforms taking my brother out on a stretcher, talking to each other in medical jargon that would sound like nonsense words to me, and pressing intimidating and scary-looking tools onto Jacob. I didn’t want Jacob to go back to the hospital. It felt like he just got back! Jacob spent pretty much all of last year at SickKids. Jake is not a normal boy: he was diagnosed with Pelizaeus-Merzbacher disease (PMD), a disease which prevents him from walking, talking and eating, not to mention his serious breathing issues. Sierra pulled a sweatshirt over her gym-suit and we put on our shoes. We called Ashley’s parents to ask if we could come over, and explained what was happening. Then Sierra and I ran down the street to her house and knocked on the door. Soon it creaked open and we entered. We nodded. She led us into the kitchen and we sat at the table. We sat there for several long moments, as Ashley’s mom put her little brother, Jack, to bed. We sat in an icy silence, hoping that everything was fine at home. After about five minutes I looked over at Sierra. She was staring at her thumbs as if they were a mildly interesting TV show. Sensing my eyes on her, she focused even harder on her sweaty fingers. When she realized she couldn’t avoid me, she looked up at me. She glared at me as if I was the stupidest person alive. “I came out laughing and talking to Maya.” Sierra burst into speech, every syllable suggesting annoyance. Ugh, our brother is … well, sick and all she cares about is that her friend is mad at her? Her friend is mad at her because she had to go help him? People’s minds work so weirdly. Someone needs to prioritize. Ashley’s mom came down the stairs and joined us. “How are you doing?” she asked sensitively. “We’ve been better,” I grumbled. Then, interrupting the silence, there was a knock on the door. We all leaped to our feet and raced there. Ashley’s mom answered. It was my mom, standing in the doorway. Her face was unreadable. My heart stopped. “Does he have to go to the hospital?” My voice was trembling. I felt like I could fly. The weight in my stomach was lifted. I gave a shaky laugh and left with my mother. I was so glad that I was there to help Dawn with the oxygen. I hate to think of what would have happened if I wasn’t home. Dawn would not have had enough arms to do everything at once. As we walked home, my house seemed a lot closer to Ashley’s than it had when I was running for my life to get there. As my house came into view, I saw a big, white ambulance and a stretcher in the driveway. The stretcher was empty. The paramedics were petting Felix, my dog, and taking selfies with him. They didn’t seem scary after all. All is fine. For now.